As you may have noticed, I am a low-level hoarder. Sometimes that pays off. 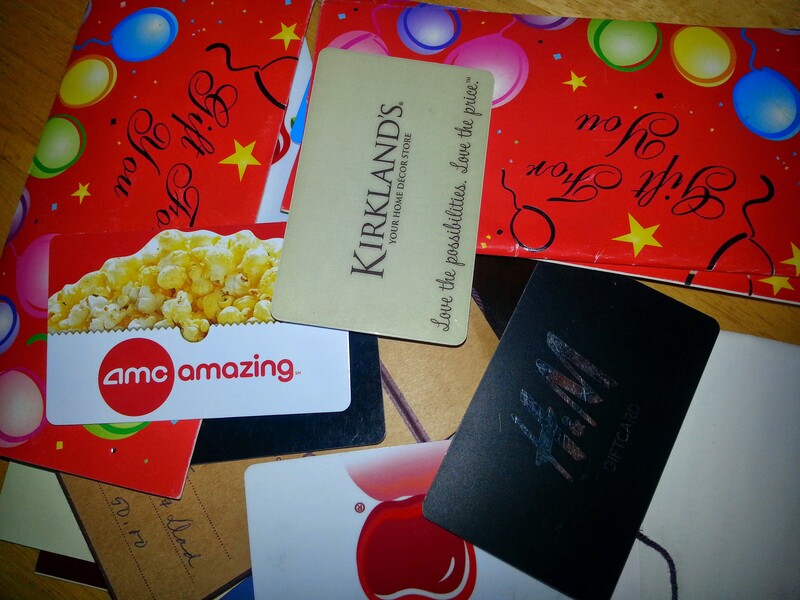 Sunday night, I extracted from my hoard a gift card to a local restaurant that my in-laws gave us in… 2008. We had used some of it and there was about $20 left. So my husband and I ordered take-out from there for dinner (it’s very good Italian food), for another $20 out of pocket. “2008? Really? I’m embarrassed to try to use this,” he said. “You use it or you don’t come home,” I replied sweetly. He tried to say that if it were me, I would also be too embarrassed to use it, but I beg to differ. I don’t like confrontation, but we’re talking about a perfectly valid gift cert, for a restaurant still being run by the same owners. Over the potential waste of $20, I will confront, oh yes. On Monday night, he and I ate the leftovers, and I also made chicken cutlets. The yummy rolls and the side of pasta that came with my meal also stretched over the two nights, for us and the kids too. Saturday, the GC stash yielded a Game Stop gift card that my son received from a friend for his birthday back in November. We took a trip there and he used the card and his own money to get a pre-owned game and a third controller. The GC card drawer also contains cards for The Children’s Place, Kirkland’s, Home Goods, Sur la Table, Applebee’s (however, I won’t go there anymore after reading that book), Barnes and Noble, LensCrafters, DSW, AMC Theaters, and (the oldest one) the Chart House. Most of them are probably half used, but still. I must remember to dig around in there more often. This week is a quiet week. I’m hoping to paint in a little while. My husband did some spackling and repairs in the room on Saturday, which made me quite happy. My son has baseball practice tonight. I just went to Acme to get some things I forgot to put in the ShopRite order, and that used up my grocery budget for March, so I must make the most of what we have now. Next week, I guess I’ll push the week’s order back to the first day of April. I have some good dinner ideas for the rest of this week, including a chicken pesto casserole. Yesterday, I finally cashed in the change that the kids and I collected back around Christmas. It totaled $28.02. Last night, I had my oldest go on the computer and find some charities we could send it to (he had already decided that he thought Haiti needed it the most). He ended up watching some videos detailing conditions in Haiti, and we talked about life there versus life here, and then I went on and made the donation (to Hope for Haiti). I was able to do it in memory of my grandfather, which was nice. So, better late than never, we wrapped up our Christmas giving. Bahahahaha @ you use it or you don’t come home! That is so cool that you and your kids search charities to donate money too! It’s wonderful that your son had already done research on one too, I hope I do a good job of raising my son to think of others as you have. Well it sounds like you are doing a wonderful job. I grew up in public schools and I agree that “thinking of others” is last on the public school list of things to teach.